2012 is turning out to be a strange one so far. Work continued to be insanely busy for the first few months but then I moved offices at the beginning of March and my “new” office is much quieter. You’d think that would give me more time to read but, being a mere 10 minute drive (at rush hour) away from our house, I no longer have a commute. Hurrah for not having to pay for a train pass; boo for not having a quiet half an hour read at either end of my working day. BUT Spring is here and this year that means plenty of bank holidays coming up (if you’re in England, that is) which in my head means lots of time for going to the park and reading and having picnics (but will more than likely actually mean me reading inside and looking out at rain…). Favourite of the month was most certainly the start to Rick Riordan’s Olympians series. Plenty of snow in the UK during February meant plenty of hours tucked up by a fire reading. My reading picked up and I got through four books, which is actually a book a week, as I’m sure you could have worked out for yourself! Kicked off with Dark Matter by Michelle Paver, it couldn’t have started better, really. I’m sure that the increase in pace is entirely attributable to the fact that I just happened to choose fantastic books: Shadow’s Edge by Brent Weeks, Snowdrops by A.D.Miller and Bitten by Kelley Armstrong. Strong month indeed. Favourite of the month is a tough one and in the end I can’t really choose between Dark Matter and Shadow’s Edge. So it’s a tie. 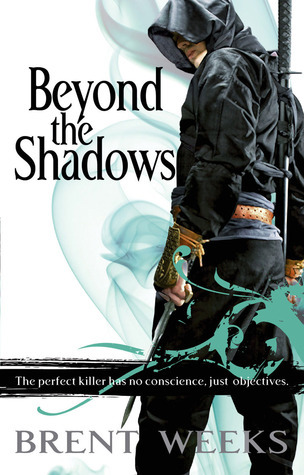 Favourite of the month is another hard one but I’m going with Beyond the Shadows by Brent Weeks because, even though it wasn’t my favourite in the series, it was the end to a wonderful series and it deserves a top spot somewhere! My review of the first in the series, The Way of Shadows, is here. And if you don’t mind some spoilers, my reviews of the second two are here. I’ve been hanging around a lot more on GoodReads recently, in no small part owing to the fact that it panders nicely to my love of statistics but also because I find the ‘Recommendations’ page oddly addictive. BUT it does remind me every time I log on that I’m x books behind my goal of reading 75 books in 2012. At this very minute, I’m 6 books behind. Thanks, GoodReads. I’ve done pretty badly with challenges so far this year too so, rather than wallowing, that’s all I’ll say. If you ever want a reminder of what I signed up for (because I’m sure you’re dying to know…), there’s always my ‘Challenges for 2012′ page at the top to keep you up to date! I hope the start to 2012 has been fabulous to you all!